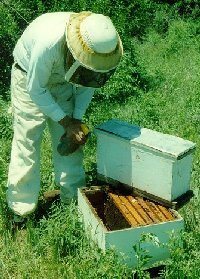 Nucleus, or "nuc" hives have fewer frames than a standard beehive. They are one of my favorite beekeeping tools, because they can keep extra queens and can be used to raise new queens. 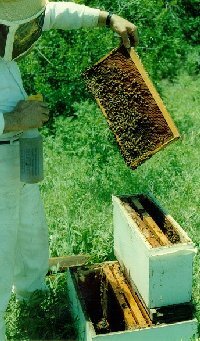 I want to get a lot of honey from my hives, and am always disappointed to find a queenless hive or a hive that is weak for some other reason. Nuc colonies provide me with spare queens and frames of brood in the bee yard that are available immediately. This allows me to re-start a problem hive, and the colony hardly misses a heartbeat. Most of my nuc hives have four frames, and I think that is ideal. Three frames does not overwinter well here in Dallas and crowds the bees. In the months before the main honey flow, I sometimes take two frames of brood out of a nuc colony to boost the strength of a regular hive. This increases my honey production and delays crowding of the nuc colony. To join a nuc colony with a regular hive that is queenless, I smoke the bees lightly and spray the bees in both colonies with a light (1:2) sugar-water syrup. The bees then seem to concentrate on licking themselves off instead of fighting. 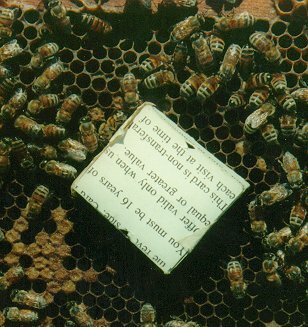 A sheet of newspaper between the nuc bees and the others may be helpful too, if the colony has more than one box. I try not to spray inside open brood cells.